HashCash emerges as a major player in the world of Blockchain payments. California based Blockchain company, HashCash Consultants and Australia’s CommBank is working towards facilitating instant cross-border settlement for the Bank’s customers. California based Blockchain company, HashCash Consultants and Australia’s Commonwealth Bank is working towards facilitating instant cross-border settlement for the Bank’s customers. 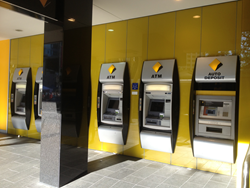 Commonwealth Bank is one of the big four Australian Banks along with Westpac, ANZ and National Australia Bank. This would be the fifth of the major win for HashCash’s network this year. According the news media, HashCash had added Alfa-Bank, Russia’s largest bank; India’s YES Bank and Federal Bank; New Zealand based, LatiPay and UAE’s largest currency exchange, UAE Exchange, this year to its Blockchain network. Observers are speculating that the company had been quietly adding dozens of financial organization to its network throughout the last year and is letting it out this year. The recent additions to HC NET positions HashCash alongside Ripple which is also making waves in revolutionizing the world of payments. What appears to be the key differentiator in case of HC NET is that the Blockchain platform offers complete transactional privacy to banks while at the same time having multiple validator nodes securing a transaction. In other words, systemic validation happens without the validator nodes ever knowing the details of the transaction attributes. Another area where HC NET seems to score is in the flexibility it offers to a bank in choosing its own set of nodes that would validate its transactions. Whereas, Ripple, publishes a “starter” membership list that network banks can edit for themselves, with the hope that their edits are either inconsequential or is reproduced by an overwhelming fraction of participants. However, because lists with ill behaved nodes invalidate safety guarantees, Banks are usually reluctant to edit the list in practice. A great deal of power therefore ends up concentrated in the maintainer of the starter list. “In HC NET, each node is enabled to chose its own quorum slice set. System-wide quorums thus arise from individual decisions made by each node,” said HashCash MD, Raj Chowdhury.